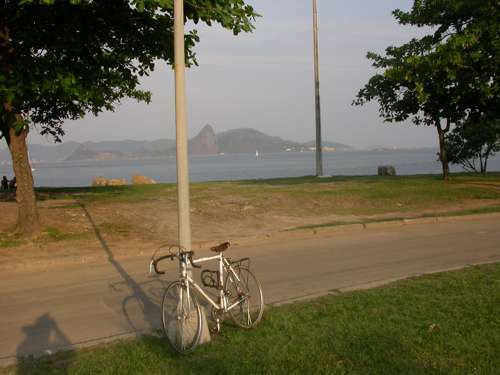 Rio de Janeiro, October 10, 2003. I've done a fair amount of traveling with my bicycle in the last few years. I take it, boxed, on the plane or bus or train and then reassamble it, often at the terminal on arrival, and use it in cities, and sometimes use it to bike between cities too. Eventually I plan many illustrated "reports" on these trips; the only one that's up so far is on the the bicycle trip I took from Minneapolis to Chicago in 2005. But there are also some pictures of my bike along the Croatian coast.